Patterns - yes, okay. Let's avoid psephology, holes in the cosmos, the psychological profiling of football club chairmen and male pattern baldness. 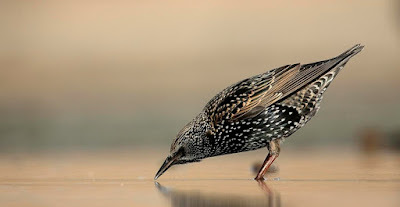 I give you the Starling, one of my favourite birds. Not only is it beautifully patterned (look closely to notice the fantastic combination of purples and greens overlaid with striking white spots that give it an iridescence), it's also a great mimic (car alarms and mobile phone tunes a speciality). Most amazing of all is it's habit of murmuration at dusk, when hundreds of thousands and sometimes over a million starlings cluster together to put on the most breath-taking of formation flying displays. The patterns they create are truly astonishing. A murmuration has to be seen to be believed. The photograph below of such a display doesn't do it justice. You have to be there live and in 3D to get the full awesomeness of what these little birds serve up. Clever starlings. They are much-maligned for being noisy and dirty but I think they are wonderful. Mozart kept one as a pet. Debate over. This week's poem is freshly-written (ink still drying even now). I hope you like it. and every eave that offers roosting space. scintillating in the slanting sun. from all points of the compass. shoal-like in pulsating, gyroscopic dance. Brilliant. Where can I read more? What a terrific piece of writing - so descriptive. 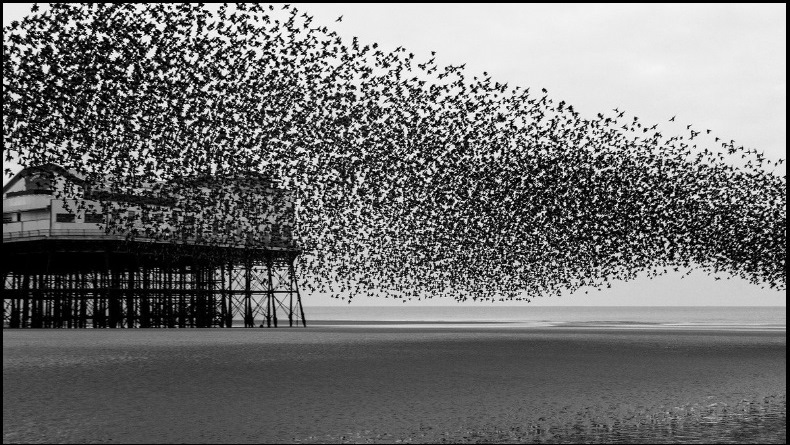 I have seen these murmurations over the sea at Blackpool. They are breath-taking and your lovely poem does them justice. Thank you. Footage on TV last night of a starling murmuration at Leighton Moss. The report said the starling population has fallen by 70% in the last few decades. That's worrying. Breath-taking Steve. I love this. Skyful Of Starlings was a joy to read. Fabulous - and the murmuring season is upon us again.